May 20: Listen to more of Brian Williams' exclusive interview with Prime Minister Tony Blair discussing war and terrorism, leadership and friendship. In this clip, Steve Carell does sketch comedy with Jenna Jolovitz at Second City in 1993. A romantic role for Steve Carell? Brian Williams: Tell me about your decision to make your announcement. For how long have you really known, really known, that this was time? Tony Blair: I think for quite a time back, maybe even over the past couple years or so. Williams: Years in the making? Blair: I mean the pressure is intense and I wasn’t just gonna try and go on and on, you know, until finally-- (laughter) they’ll rise up and revolt and chuck you out. With the prime minister as our tour guide, we climbed the stairs that are lined with the pictures and signatures of every British prime minister with, as luck would have it, space left at the top for Tony Blair. Blair: That’s where I might be? After 10 years in the job, an era is ending for Tony Blair, a politician who once burst on the scene exhibiting regal charm coupled with a common man’s touch. 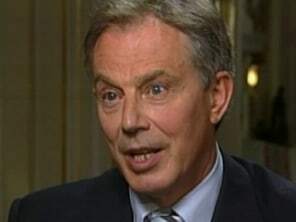 In 1997, Blair swept his labor party into power, after 18 years on the outs, becoming, at the age of 43, Britain’s youngest prime minister in almost 200 years. His decade at number 10 Downing Street started with enormous promise and an enduring friendship with another charismatic leader—Bill Clinton. Blair: Bill Clinton is a masterful politician. I think he did an immense amount for America, was great to work with, and I will remember particularly his contribution up in Northern Ireland and Kosovo. Williams: There’s a story that has made the rounds in Washington. Love to know if it’s true. That when the Bush administration started, you had a very candid talk with the new President Bush and said, “Bill Clinton is my friend. He’s going to remain my friend, and he will always have my support. And I hope, Mr. President, that that’s going to be okay with you going forward.” Is that true? Blair: Something like that. Yes. Williams: How did he take that? Blair: Fine. I think he understood completely. I’ve remained a close friend of President Clinton’s and I’m proud to call him a friend. It was a friendship that survived through thick and thin. Most famously, back in 1998, when Tony Blair stuck by Clinton during an awkward joint press conference at the height of the Monica Lewinsky scandal. Reporter: At what point do you consider that it’s just not worth it, and you consider resigning from office? Bill Clinton had his own political undoing, just as Tony Blair has now had his. The war in Iraq, seen by many as Bush’s war. Tony Blair was seen as the American president’s comrade-in-arms. Williams: Let’s take on the topic of Iraq. How Mr. Prime Minister does it not cut you to the quick in—in some deep way when you read the expression—a poodle—lap dog to American presidents, especially this president and especially this war. Blair: I mean I’ve got used to a very intense level of criticism over it. You see, I’ve never had any doubt since September 11th that our place was, as I said at the time, shoulder to shoulder with America. Sept 20, 2001 Speech: And I say to you, we stand side by side with you now, without hesitation. Blair: I believe that what we’re facing today in Afghanistan, in Iraq, is part of a broader global struggle. It’s not a battle that we have to win. It’s a battle we can’t afford to lose. As deadly difficult as the war in Iraq is today, it doesn’t seem to have publicly cooled the Bush-Blair partnership. Blair: I have found him immensely straightforward to deal with, someone always true to his word, and someone who’s a very strong leader. Williams: But, it’s been said, Mr. Prime Minister, you can’t have been happy with the American management of the war. You can’t have been happy with the decisions of Secretary Rumsfeld. Did you ever voice any of that to your friend, the president? Blair: Look, there are discussions that you have in the course of something like this that’s—again should remain between allies. But you can debate many of these issues, issues to do with the disbandonment of the Iraqi army and so on. It’s not the fundamental problem. The fundamental problem is there are people who were going to come into Iraq and try to disrupt and destroy the process towards democracy in that country. Williams: You’re perfectly willing to walk away from this job knowing that you will be forever linked in history to President George W. Bush and that your legacy is wrapped up in your decision to join him in what critics of it call a purely elective war in Iraq. Blair: Yeah, but, you see, in the end with this job, you take your decisions, your make your judgments, you stick by them if you think they’re right. And that’s what I’ve done. And I can’t do it any other way. I’m not gonna do it any other way. Back home, a lot of Blair’s fellow Brits view the U.S. relationship as one-sided and out of balance. As a result, a few years back, the British screenwriters of the Hollywood movie, “Love Actually,” decided to include a scene they perhaps would like to see one day playing out in real-life. Williams: “David Beckham’s right foot, (laughter) David Beckham’s left foot,” of course, he’s since moved to L.A.
Williams: “And a friend who bullies us is no longer a friend. And since bullies only respond to strength, from now onward, I will be prepared to be much stronger, and the President should be prepared for that.” Has any part of that wording ever, even in your fantasy life, occurred to you? Blair: When that bit of the film is played, often the audiences would applaud at the end of the speech. Williams: I would imagine so. Blair: Yeah. ‘Cause it’s a great speech. It’s a movie. And it’s not life. And it’s not real life. And the implication is that America and Britain want different things in the world. And I don’t believe that is true. If we ever for a single moment think it is smart to be anti-American, then we will make a mistake of fundamental proportions for our future. As he prepares to step down next month, the prime minister gave NBC News rare access—seldom seen even by the British press—to the office where he has made his most important decisions, none more crucial or controversial than taking his nation to war in Iraq. Not only did it propel his poll numbers to record lows, it has threatened to overshadow such real Blair accomplishments as peace in northern Ireland and economic prosperity at home. Williams: And so, when I’m doing the news the night you walk out of number 10 with your wife and family, the Jaguar pulls up and carries you away, we should know that you are feeling fulfilled? Williams: Wistful? Happy? Sad? Lucky? Fortunate? Blair: I think I will feel that it was a privilege to have had this job, that however difficult the challenges have been whatever the disappointments or even the mistakes, that’s for other people to judge and maybe for me to inquire of my own mind and conscience. But I still think it’s an honor to have done the job.